Parade around with the 4 inches x 6 inches Canada Flag, it is very easy to carry and hold for all National Day holidays and for all sporting events to encourage our Canadian teams. It can easily fit in your luggage during your holidays. This patriotic article can also be used as a decorative item for centerpieces on all your special events to represent Canada. 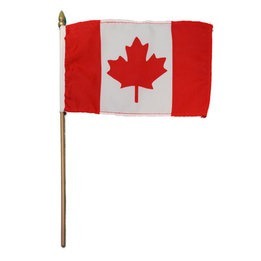 The Canada flag measures 4 inches x 6 inches and stick measures 10 inches. This festival accessory is sold in packs of 12 and is not recommended for children under the age of 5 years old.